TECHNOLOGY WATCH: New Biblical Text Discovered. Thanks to a grant from the German Research Council (DFG - STU 469/1-1), multi-spectral imaging has revealed never-before-seen Ethiopic text in a palimpsest at the Staatsbibliothek zu Berlin (Ludwig-Maximilian University, Munich). Among the manuscripts catalogued by August Dillmann in his 1878 Verzeichnis der abessinischen Handschriften in the Royal (now State) Library of Berlin is one of the few known Ethiopic palimpsests, Petermann II Nachtrag 24, the upper writing of which, datable to the 17th century, includes a commentary on the Book of Revelation. Via funding from the Deutsche Forschungsgemeinschaft (project no. STU 469/1-1, Textkritische Ausgabe und Übersetzung des 1 Henoch) and with the gracious support of the Orientabteilung of the Staatsbibliothek zu Berlin (Curator, Christoph Rauch), it was possible to conduct multi-spectral imaging of the manuscript from 24. October to 4. November 2016. This work has enabled significant sections of the undertexts to be read, revealing fragments from at least nine earlier codices, the majority of which date to the 14th century and before; several texts contain archaic linguistic features attested in only the earliest stratums of Ge'ez material evidence. Manuscripts represented include Enoch, Acts, an Old Testament lectionary, a homiliary, and multiple hagiographic codices. Past posts on palimpsest manuscripts (manuscripts whose original text has been over-written with a new text) are collected here, plus here and here. ETC BLOG: Depiction of Crucifixion (SBL Report) (Peter M. Head). The gem is of interest for its early (c. 200 CE) iconography of crucifixion and of the appearance of Jesus. That said, I would like more clarification about its provenance (it seems to have been "acquired" rather than excavated archaeologically) and how certain specialists are (and on what grounds) that it is genuine. The new edition by David Litwa offers, after an introduction, a new Greek text, a fresh English translation on facing pages, explanatory notes, a bibliography, and indices locorum et rerum. Litwa understandably is critical of Marcovich’s cavalier treatment of the manuscript tradition and opts for a more conservative approach, although he does adopt quite a few readings proposed by Marcovich. The problem is that Litwa does not present us with a critical apparatus. Occasionally he offers some text-critical comments in his explanatory notes, but if the user wants to be informed about what is in the mss he/she still has to turn to Marcovich’s apparatus criticus. So although this edition should have replaced Marcovich’s idiosyncratic one, it does so only partly. That is not to say that Litwa’s text is not better than Marcovich’s. A random check of several dozen of places convinced me that it is. Yet another reason why we cannot discard Marcovich’s edition altogether is that it contains a very valuable index verborum (at pp. 436-541). Whoever wrote it (and van der Horst is confident that it wasn't Hippolytus), the Refutatio omnium haeresium is an important source for lost ancient literature, particularly that of the Pre-Socratic philosophers and of the Gnostics. JAMES MCGRATH: A Paulish Mistake in the Mandaean Book of John? Charles Häberl has started blogging again recently, about the Mandaean Book of John and related texts, in a series of truly fascinating blog posts. I’d like to highlight a few of them here. Cross-file under Mandean Watch (Mandaean Watch). Inscription About Ancient 'Monkey Colony' Survives ISIL Attacks. A number of artifacts with inscriptions survived in the ancient Assyrian city of Nimrud, after the terrorist group ISIL (also known as ISIS or Daesh) destroyed the site. The group targeted Nimrud, along with many other historical sitesin Iraq and Syria, in an attempt to eradicate the history of the Assyrians, Shiite Muslims, Kurds and other peoples who live in Iraq and Syria. Countries and groups around the world have condemned this destruction of cultural heritage as a war crime. Live Science showed photographs of some of the surviving inscriptions to scholars who translated or deciphered their meanings. The inscriptions tell a number of stories about the AssyrianKing Ashurnasirpal II (reign 883–859 B.C. ), including the lands he conquered, the treasures he took, the palace he constructed and the ancestors he had. THE UNIVERSITY OF CAMBRIDGE: University Lecturer. University Lecturer in Classical Rabbinic Literature, Faculty of Divinity, Cambridge The Faculty of Divinity, West Road, Cambridge, invites applications for a University Lectureship in Classical Rabbinic Literature (Grade 9, £39,324 to £49,772). Candidates, whose research specialism may be in any field of Classical Rabbinic Literature, with a research specialism in the texts, thought, and history of classical rabbinic Judaism, encompassing the basic timespan from the redaction of the Mishnah to the redaction of the Babylonian Talmud, should have a doctorate in the field. The person appointed will be expected to undertake high quality research in Rabbinics, to teach for the Tripos, Diploma and the MPhil, to supervise doctoral students, and to undertake some administration. The postholder will be based in the Faculty of Divinity, West Road, Cambridge. Candidates should be able to take up the post on 1 September 2017. The appointment will be subject to five years' probation. Follow the link for further particulars and application instructions. FACES AND VOICES BLOG: Overdue: Dating Early Christian Papyri at the SBL Annual Meeting. A Report (Roberta Mazza). You know academics are always late, right? So I am super-late in reporting a much fun session I organised and chaired on November 21 in San Antonio (Texas), at the last Annual Meeting of the Society of Biblical Literature, a monster of a conference gathering together thousands of people interested in the history of the Bible from the most amazing perspectives. More on Brent Nongbri's work is here and here. More on the dating of papyri with Raman spectography is here and here. And what is it with the date-testing of the ink of the Gospel of Jesus' Wife fragment? Why do I keep hearing different and apparently inconsistent versions of the results? First that the ink was just "consistent with an ancient origin"; then that it was dated to 200 CE (much earlier than the papyrus it is written on); and now that its pigment "presented some similarities to those of the second century CE," but its "morphology" (whatever that means) "was different from those of securely dated papyrus samples" and therefore it was concluded that it was a forgery. This sort of apparent discrepancy underlines the point that I have been making recently: we should be skeptical of any reports about materials testing of allegedly ancient artifacts unless the full lab reports have been released and the details examined and verified by outside experts. Honi the Circle-Drawer and ... cryonics? TALMUD WATCH: Torah For Today: Cryonics. Rabbi Ariel Abel offers the Torah’s take on the latest scientific frontier (Jewish News). Cryonics opens a new frontier in science. The preservation of materials at a very low temperature will one day lead to bodies being preserved for revival at a later date. What does the Torah have to say about this? Essentially, there is nothing wrong with waking up at a later time than one’s designated life. However, such revival can lead to disappointment. The Talmud cites the example of a sage who woke up 70 years after he had first fallen into a slumber equivalent to death. Unfortunately, he only wished to die again, and this time permanently, as he found that noone recognised him. The sage was Honi the Circle-Drawer, who famously prayed for rain and in his merit drought was averted. Not untypically, the article does not give the Talmud reference, but it is b. Taanit 23a. You can read it here. THIS IS WAR: Historic Iraq Sites Reclaimed in Mosul Offensive (Owen Jarus, Live Science). A military offensive to take back the city of Mosul, Iraq, from the terrorist group ISIL (also called ISIS) has also resulted in the retaking of several historic sites that ISIL destroyed and looted. The article describes the current state of Khorsabad (background here), Mar Behnam (background here and links), and Nimrud. It's not good. UPDATE (10 December): More on Nimrud and its inscriptions is here. Review of Hayes, What’s Divine About Divine Law? ANCIENT JEW REVIEW: Divine Law in the Container Store (Beth Berkowitz). One of my favorite stores is the Container Store. The Container Store offers a vision of order. Even your socks and bras and underwear have special containers designed to keep them from disarray. Reading Chris Hayes’s book is the intellectual equivalent of walking through the Container Store. She takes a hugely messy literary heritage from antiquity and, with seemingly magical powers of containment, brings conceptual order to them. Hayes shows that these texts are caught up in common questions, and are simply answering them in different ways for different reasons. Hayes doesn’t hide the mess; she’s not throwing all the dirty clothes and papers into the closet. On the contrary, Hayes is very taken with the textual subtleties, and the multiplicity of discourses. The achievement of Hayes’s book is that its conceptual refinement never entails reduction. Hayes organizes without simplifying. Past PaleoJudaica posts on the book are here, here, here, and here. One of the original announcements, with some instructions, is here. The Facebook page is here. And this year the Hallmark company even takes notice of the day. Follow this link for past posts on the day and related links. Have fun and stay out of trouble. BOOK REVIEW: Author sheds light on the menorah (Jonathan Kirsch, Jewish Journal). And how could I not quote this paragraph? This review is aimed at a popular audience, but it is considerably more sympathetic and more substantial than the earlier review in the New York Times. RECYCLING: New water: Benedictine Sisters in East Jerusalem revive ancient cisterns (Melanie Lidman, Global Sisters Report). The olive trees on the Mount of Olives next to Jerusalem's Garden of Gethsemane stand gnarled and silent, their knobby trunks reaching out of the rocky hills, a testament to thousands of years of careful cultivation in one of the holiest spots on Earth. This four-acre olive grove belonging to Benedictine sisters looks out on the golden rotunda of the Dome of the Rock, glinting in the sunlight, and the walls of ancient Jerusalem following the contours of the hills and wadis. From the grove, their trees stand witness to the path Jesus took to the Garden of Gethsemane on the night of his betrayal. But the Benedictine Sisters of Our Lady of Calvary, who have inhabited this old stone convent for the last 120 years, also see another side of the historic olive grove: the Jerusalem municipality water bill. A few hundred meters away, on the other side of the hill from the Benedictines' monastery, Jerusalem descends sharply into the desert, sparse vegetation giving way to barren rocks until you reach the Dead Sea, Earth's lowest spot on land. This proximity to the desert also means that the olive trees need buckets and buckets of water — about $2,500 of water per month and sometimes even more in the brutal summer heat. Cisterns are an ancient method of collecting rainwater in underground stone caverns for household use and irrigation. The Benedictine compound has more than 20 cisterns, though they had fallen into disuse and no longer functioned. By renovating them and reverting to the traditional method of capturing rainwater, the sisters will cut down dramatically on their use of municipal water. "We believe the cisterns are from the sixth century, and that maybe there was a Byzantine monastery here," said Penka. "One of our cisterns is more rectangular. Usually cisterns are like a round bottle. This one and another one are rectangular. We think maybe it was a burial place." "Without archaeological excavations, it's hard to know exactly what was in this spot," Patrich said of the Benedictine convent. "The cisterns could be from the Byzantine period, from as early as the fourth century." Patrich said it is likely that the Benedictine convent was built on top of previous religious buildings. "There were a lot of important convents and monasteries in this area," he said. Was the oldest Hebrew preserved in Egypt? PHILOLOGY: Hebrew may be world's oldest alphabet (Walt Bonner, Fox News). Yes, that pretty much sums it up. In an earlier post I linked to some skeptical evaluation by Northwest Semitic epigrapher Christopher Rollston and Egyptologist Thomas Schneider. But Professor Petrovich has a new book coming out with Carta Books in which he will make his case more fully. That would be more interesting if he were publishing in a peer-review venue, but let's see what kind of case he makes, nevertheless. SAMUEL ZINNER: The Jordanian Lead Books, David Elkington's Sensationalism and Plagiarism: A Statement (Academia.edu). This is a statement from one of the scholars on the evaluation panel of the Centre for the Study of the Jordanian Lead Books. I have referred cautiously positively to his draft work on the codices here and here. This statement appears to clarify much, including the mixture of apparent nonsense and apparently serious content which has appeared in recent media treatments, as well as the current state of play concerning the codices themselves. Obviously, I can neither confirm nor dismiss any accusations made in it about any specific person. I link and quote for information and you can make up your own minds. The scholarly assessment of the artefacts contents should be left to trained experts, whose private, tentative findings should not be quoted in public without permission or be taken out of their original contexts. However, the scholarly investigation of the artefacts is hampered by the fact that Elkington denies access to his full set of photographs to any scholar critical of him and his sensationalistic views. As I remarked above, if the only images I had seen of the lead books were the ones circulating on the internet, I'd ignore the story. If Elkington wants more experts to be interested in the artefacts, then he should release all of the images in his possession and see what happens. Anyone interested in the story of the metal codices should sit down and read the whole essay. For my part, I remain unconvinced that any of the metal codices are ancient artifacts and I remain to be persuaded that any are not modern forgeries. There are many indications in what I have seen that they are not ancient productions and I have not found the arguments advanced for their antiquity, even on the Lead Books Centre website, to be at all convincing. But it is true that I have not seen everything. If there is compelling evidence that some of them are ancient artifacts, I look forward to seeing it in a peer-review publication. The materials tests may or may not be conclusive or important. As I have been saying, if they are relevant to the issue, the lab reports should be made public. Meanwhile, I commend Dr. Zinner for giving us his insider's perspective on the current situation and the current state of the question. If you are interested in following the story, it would be wise not to take anything published by the media too seriously and to look to the Jordanian Lead Books Centre website and its members for information on what is going on. And I, of course, will do my best to keep you up to date at PaleoJudaica. HT Basil Lourié on Facebook. Background here and many, many links. Cross-file under Fake Metal Codices Watch. I acknowledge that various elements of the current discussion may point to some of the codices being something other than fake, but I remain to be convinced. And in any case, I continue to include this cross-file rubric so that all my posts on the subject can be accessed together. 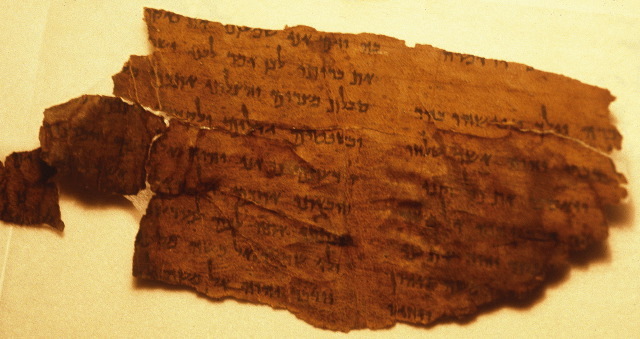 CALL FOR PAPERS: The Dead Sea Scrolls Seventy Years Later. Manuscripts, Traditions, Interpretations, and Their Biblical Context. John Paul II Catholic University of Lublin, Poland, October 25, 2017 – October 26, 2017. Follow the link for details. Abstracts of proposed papers must be submitted by 15 July 2017. AWOL: Open Access Journal: The Societas Magica Newsletter. First posted at AWOL and noted by PaleoJudaica five years ago. But many more articles have come out since then and it is worth noting again. READING ACTS: Who are the Weak and Strong in Romans 14? Were the "weak" gentiles or Jews, or was Paul being intentionally ambiguous? 'TIS THE SEASON: The REAL Saint Nicholas! December 6 (HolyLandPhotos' Blog). "Real" is perhaps a stretch. He still sounds pretty legendary, although he did live at the time indicated. Apparently, we even still have his body. Background here and here. BOOK REVIEW: 400 Years of Jerusalem Culture (RUBY NAMDAR, New York Times). Illustrated. 352 pp. The Metropolitan Museum of Art. $75. The book under review deals with a era later than PaleoJudaica's normal period of interest, but the interest of that later era in earlier Jewish history is interesting in itself. The Metropolitan Museum’s much discussed new exhibition, “Jerusalem, 1000-1400: Every People Under Heaven,” as well as a beautiful catalog now offered to the public, does not necessarily emphasize the above-mentioned conflict. But it does celebrate the aesthetic richness that ensued from it by presenting the viewer with some of the most magnificent and meaningful artifacts. It is the city’s story told through its material culture. Years of intensive curatorial efforts have yielded a large number of rare objects, some of which have never before been allowed to be taken out of their showcases, much less be shipped overseas and displayed abroad. Among the most exciting are a rare collection of gold coins dated back to the 11th century; the marvelously intricate gold filigree jewelry, made in the Islamic tradition; large jewel-encrusted crosses and relic-boxes, made in the European tradition; and European-Jewish jewelry depicting the long lost temple destroyed by the Romans in A.D. 70. Of special interest are the rare manuscripts that seem to receive special attention in the exhibition and the catalog: Hebrew, Aramaic, Syriac, Arabic, Latin and Persian texts, often lavishly ornamented, gilded and painted with vivid colorful images of the holy city. These books were the prized possession of aristocratic Jewish, Muslim and Christian families who used them as a way to show off their wealth and power at the same time as their piety and devotion. BIBLE PLACES BLOG: Was Paul Heading for Alexandria? (Todd Bolen). At last month’s meeting of the Evangelical Theological Society, Mark Wilson suggested in a lunch gathering sponsored by Tuktu Tours that Paul’s original destination on his first journey was not Galatia but Alexandria. This talk was based on an article that he co-authored with Thomas W. Davis that is available at the website of Pharos Journal of Theology. I thought that a brief sketch of their argument might be of interest to readers here. ARAMAIC WATCH: Monk Brings Ancient Religious Texts To Abilene (TREVOR WYATT, Abeline Public Radio). Father Justin, a Librarian in the Monastery of St. Catharine at Mount Sinai, Egypt, was the guest speaker at the inauguration. More on the Center for the Study of Ancient Religious Texts is here. For more on (correct spelling) Codex Climaci Rescriptus, see here, here and links. And more on St. Catherine's Monastery and its recent difficulties is here, here, and here and links. YAZIDI WATCH: Yazidi Freedom of Thought Honored (Rene Wadlow, Media for Freedom). Background on the Yazidis, their Gnosticism-themed religion, and their tragic fate in the hands of ISIS, is here with many links. And an earlier post involving Nadia Mourad Bassi Taka is here. ZOOLOGY: The 'Zoo Rabbi' makes a good impression (Shayndel Plotkin, Sun Sentinel). Leviathan soup anyone? Well, not quite, but exotic cuisines including quail, dovetail soup and chocolate-covered locusts were just a few items on the menu this past month at the Biblical Zoo in Israel. As far as Rabbi Natan Slifkin a.k.a. the "Zoo Rabbi" can attest, it was delicious! Serving exotic Kosher animals is only part of the experience you will have with Rabbi Slifkin and the staff at the Biblical Museum of Natural History, located in Beit Shemesh, Israel. You also will learn about the many uncommon or more obscure aspects to The Bible and its personalities. As Slifkin spoke of his one- million-year-old fossil or the Talmud's theory of a "mud mouse," it felt as if I was reading a "Ripley's Believe it or Not" or Harry Potter novel. He imparted his enthusiasm for the off-the-beaten-track types of excursions and explorations written about in his research-based books and lectures. Another article on the Biblical Museum of Natural History was noted earlier this year here. And for more on Dr. Slifkin, follow the links there. H-JUDAIC: Internet Resource: New Link for the PIRQÉ RABBI ELIEZER ELECTRONIC TEXT EDITING PROJECT. PaleoJudaica noted the project at its old address many years ago. MICHAEL LANGLOIS: The Dead Sea Scrolls’ Revelations on the Origins of Christianity, December 7, 2016 in Paris. That's the day after tomorrow. ETC BLOG: Vetus Latina Workshop, 15-16 December, Wuppertal (Peter Williams). GREENVILLE COLLEGE: Assistant/Associate Professor of Theology in Jewish-Christian Studies. The job seeks someone with a "Ph.D. in Theology or Biblical Studies with an emphasis in Early Judaism or Jewish Studies," but also a specific faith commitment in the Wesleyan tradition. PALMYRA WATCH: Swiss seize artifacts looted from Syria’s Palmyra. Items, also from Yemen and Libya, arrive via Qatar; they’ll be displayed in Geneva until they can be returned (AFP). Many more posts on Palmyra, its history, the ancient Aramaic dialect spoken there (Palmyrene), and the city's tragic recent fate in the hands of ISIS are here, here, and here (cf. here) and follow the links. R. Akiva's pesher call-to-arms against Rome? DR. MEIR BEN-SHAHAR: Rabbi Akiva’s Laugh: The Hidden Call for the Bar Kokhba Revolt. A New Reading of the Midrash of R. Akiva and the Fox on the Temple Mount (TheGemara.com). Abstract: In recent years, a growing consensus has emerged that the Bar Kokhba revolt should be connected to Rome’s establishment of the city of Aelia Capitolina on the ruins of Jerusalem. A new interpretation of Rabbi Akiva’s famous consolation upon seeing a fox emerge from the Holy of Holies (Sifre Deuteronomy 43) suggests that this homily can actually be read as a call to arms against Rome. PUNIC WATCH: In season: Pomegranates, the fruit of myths (Jeff Cox, The Press Democrat). This article deals in part with the historical use of the pomegranate and it mentions some interesting details. No ancient references are given and I have not verified the details, but I quote a paragraph here for whatever it is worth. The Phoenicians established colonies around the Mediterranean, including at Carthage in North Africa. The Romans called Carthage Punis — a word derived from Phoenicia — hence “the Punic Wars.” They called the pomegranate mala punica, or “Carthaginian apple.” And punica became the name of the genus to which the pomegranate belongs. The gem we call garnet comes from “granate” in the word pomegranate, and is the color of the juicy seed sacs. Another recent post on the ancient background of the pomegranate is here. THE CRITICAL REALISM IN THE NEW TESTAMENT BLOG: Educated Galileans? (Jonathan Bernier). HT James McGrath on Facebook. Also, I have not been following Jonathan Bernier's series on Robinson's book, but you may want to have a look at it as well. NUMISMATICS: Spain: Popular “Numismatic Treasures” Coin Series Launches Seventh Set (Michael Alexander, Coin Update). For only one hundred Euros you can own a gold reproduction of a Carthaginian Hemidracma from Ebusus. Or, if your means are more modest, ten Euros will buy you a silver reproduction of a Phoenician Drachma from Gadir. Cross-file under Punic Watch, Phoenician Watch, and For You, Special Deal! What watered the ground in Genesis 2:6? RELIGION AND LITERATURE OF ANCIENT PALESTINE BLOG: Chaoskampf, the Garden of Eden, and the Mountains of Lebanon (Ryan Stephen Thomas). I have a new paper up on the Garden of Eden that explores its mythological background in Canaanite-Israelite mythological tradition. Among other things, I argue that the mysterious ʾēd that comes up to water the ground in Gen 2:6 is correctly translated “flood” and that the motif hearkens back to an ancient Canaanite myth in which El created the world through defeating the primordial Sea monster. This discovery then leads me to reconstruct how the biblical Garden of Eden story has evolved over time, with particular emphasis on the identity of YHWH-Elohim and the original mountain location of Eden in Canaan. I show how at an earlier stage in the narrative the divine protagonist was likely El rather than YHWH-Elohim and that the site of Eden has been adapted from Mount Lebanon to a non-defined place somewhere on the eastern horizon. A long technical essay that will mostly be of interest to specialists.